Visiting the Statue of Liberty is something every American, especially those who had family members who immigrated to America, should never miss. Taking the ferry toward the historic site helps you see and feel what your grandmother or great grandfather may have experienced on their arrival at Liberty Island. The history through photos and actual records at the monument are priceless and tell of all the challenges immigrants faced to come to the 'new world' and what a light of liberty to the world she represented. Located on a 12 acre island, the Statue of Liberty Enlightening the World was a gift of friendship from the people of France to the people of the United States and is a universal symbol of freedom and democracy. The Statue of Liberty was dedicated on October 28, 1886, designated as a National Monument in 1924 and restored for her centennial on July 4, 1986. 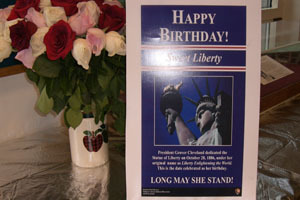 Lady Liberty celebrated her 200th birthday on November 28, 2009. 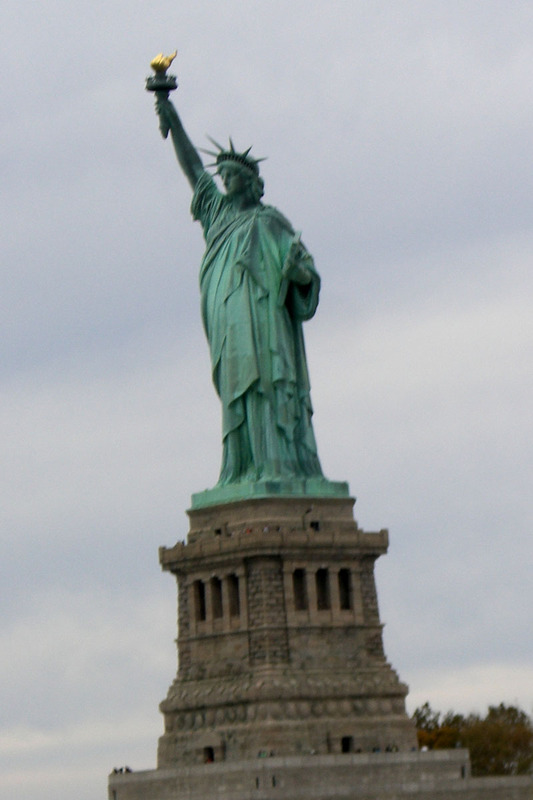 NYC offers a City Pass available that provides a speedy entrance for those wishing to see the Statue of Liberty. 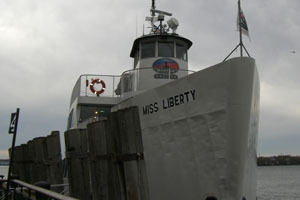 Visitors can take the NY Metro to Battery Park, where they can board the Miss Liberty, which travels to both locations. The ferry runs every twenty minutes and is very comfortable, offering refreshments, and great photo opportunities of the New York skyline and the national monuments. 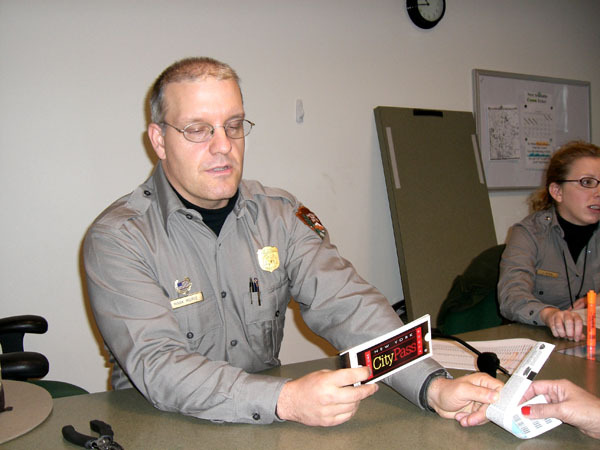 The monuments are managed and operated by helpful Park Rangers. Food service venues are available at the Statue of Liberty and Ellis Island. Be sure to take a jacket; it can get chilly when traveling on the ferry out to the island, especially in winter months. 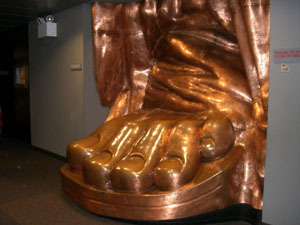 The complete history of the design and creation of Lady Liberty fills the museum, including the design work done by Gustav Eiffel, creator of the Eiffel Tower in Paris, the story of the dedication of the French people to raise the funds to build the Statue of Liberty, and samples of the actual casts used in her formation. Visitor Advisory: The elevator at Liberty Island will be out of service for an extended period of time. Guests with Monument Access Tickets must be able to climb 168 steps to reach the top of the pedestal. We regret any inconvenience this may cause and will update this site as soon as information is available. This will not effect Crown Tickets Holders as the only way to reach the Statue's Crown is to climb 354 steps. Monument tickets are required to enter any level of the Statue of Liberty National Monument including the pedestal and museum. See next bullet for how to get this essential ticket. Ticket Reservation System: Call 1-877-LADY-TIX or go online to www.statuecruises.com to get all the details on reserving tickets to the pedestal, museum, crown and Liberty Island from Statue Cruises. Choose which visit fits your schedule and interests. Reserving Tickets to Visit the Crown: Access to the crown is limited and reservations are the only way to obtain crown tickets. Here you'll find answers to frequently asked questions that will help you plan your visit. Security Screening: Visitors to the Statue of Liberty and Ellis Island must pass through security screening (similar to airport security procedures) before boarding the ferry system and entering the monument. There can be long wait times at these screening areas. Enjoy your experience at the Statue of Liberty. Opened on January 1, 1892, Ellis Island became the nation's premier federal immigration station. In operation until 1954, the station processed over 12 million immigrant steamship passengers. The main building was restored after 30 years of abandonment and opened as a museum on September 10, 1990. 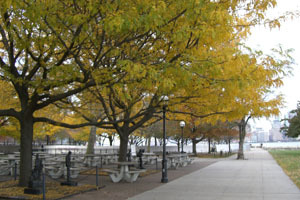 The island has a wonderful picnic area filled with statues of the great men who contributed to the greatness of America offers visitors a pleasant spot to have lunch while enjoying the historic park atmosphere, and panoramic views of New York City. Today, over 40 percent of America's population can trace their ancestry through Ellis Island. Computers in the musuem allow visitors to access family history informaton available. During the island's 62 years of operation, over 12 million immigrants were processed at Ellis Island, including those who have become notable in society such as: Frank Capra, Bela Lugosi, Baron Von Trapp, Irving Berlin, Max Factor, Xavier Cugat, Rudolph Valentino, Igor Sikorsky and Bob Hope. American Family Immigration History Center (AFIHC) at Ellis Island. 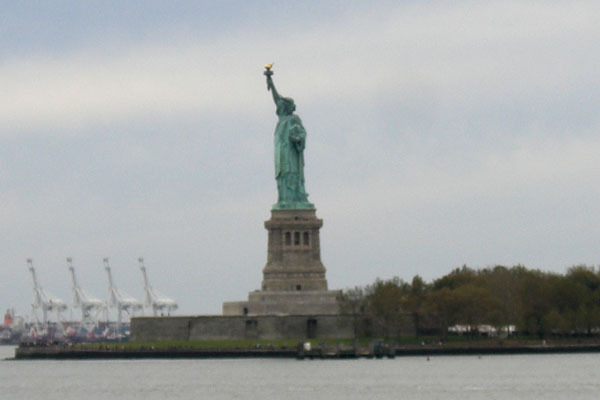 Official site for Statue of Liberty and Ellis Island Foundation containing manifests of 25 million immigrants, passengers, and crew members who entered New York Harbor between 1892 and 1924. Records can be searched at Ellis Island or on-line. Chicago�s 44 million+ annual travelers have the perfect spot to find city information and travel tools at the enhanced Water Works Visitor Center. The Center is located in the historic Pumping Station at 163 E. Pearson, along Chicago�s Magnificent Mile and across the street from the iconic Water Tower. The remodeled Visitor Center offers space for travelers to browse racks filled with maps and brochures about Chicago-area events, attractions and tours, as well as comfortable seating for them to review the information and plan their activities. Friendly and knowledgeable visitor information representatives are on hand to answer questions and help visitors create an action-packed itinerary. -First Slice Pie Cafe � First Slice Pie Cafe serves pizza, sandwiches, soups, salads and homemade pie. A portion of all proceeds is donated to the First Slice community kitchen, which provides meals to homeless men, women and children. -Hot Tix � Operated by the League of Chicago Theatres, Hot Tix offers half-price tickets to more than 200 theaters throughout the Chicago area. Hot Tix are available up to six days in advance and on the day of the show. The show list is updated continuously on www.hottix.org as tickets become available. Hot Tix is also an authorized Ticketmaster outlet. -Chicago Public Library � The Chicago Public Library offers Chicago reference books for visitors to read in the building. The Library also provides a small collection for Chicago library card holders to check out, in addition to serving as a pick-up location for materials ordered online by card holders. The Visitor Information Center is open Monday � Thursday from 8am � 7pm; Friday from 8am � 6pm; Saturday from 9am � 6pm; Sunday from 10am � 6pm; and Holidays from 10am � 4pm. It will be closed on Thanksgiving, Christmas and New Year�s Days. Hours for First Slice Caf�, Hot Tix and the Chicago Public Library may vary. Built on the site of Chicago�s first municipally owned water works in 1867, the Water Works Pumping Station was completed in 1869 as part of a plan developed by Ellis Sylvester Chesbrough, Chicago�s first Commissioner of Public Works. Located across Michigan Avenue from the Historic Water Tower, the Pumping Station was, in turn, connected via a tunnel to a wooden pentagonal intake crib located two miles east, offshore in Lake Michigan. The Chicago Office of Tourism also operates a Visitor Information Center in the Chicago Cultural Center (77 E. Randolph Street) and the Millennium Park Welcome Center (201 E. 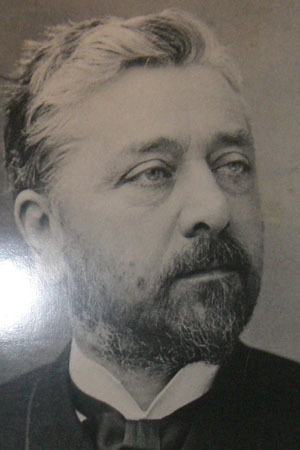 Randolph.) Visitors can also find information about Chicago at www.explorechicago.org, the city�s official tourism website, or by calling 877-CHICAGO. For those calling from outside the United States, Mexico and Canada, please call 1.312.201.8847. The TTY toll-free number for the hearing impaired is 1.866.710.0294. Palais Stephanie, the newest hotspot in Cannes, is offering the tempting Azur Gourmet package valid through April 2010 highlighting the hotel�s new La Scena Lounge Bar and Restaurant, the place to see and be seen in this stunning city on the French Riviera. The Azur Gourmet package includes accommodation, daily dinner or lunch at La Scena and an in-room gift of Champagne and gourmet chocolates. Rates start from 185 Euros per room, per night, based on single or double occupancy including VAT and city tax. Patrons can lounge al fresco with gorgeous views of the Bay of Cannes or nestle inside the modern redesigned dining room. The eclectic menu serves a selection of dishes from Italy, Japan and France giving La Scena an international appeal. Starters include homemade duck foie gras or a variety of sushi and sashimi offerings. For the main course, guests can choose from grilled bass with Carnaroli risotto and truffle, fillet of veal with saut�ed gnocchi and wild mushrooms, and selection of savory pastas among other sumptuous dishes. The Azur Evasion package valid through May 2010, includes accommodations, daily continental breakfast, and in-room gift of Champagne and gourmet chocolates. Rates start from 165 Euros per room, per night, based on double occupancy including VAT and city tax. The Azur Sky Discovery package valid through October 2010, includes accommodations, daily continental breakfast and a thrilling 45-minute private jet flight over Cannes. Rates start from 245 Euros per room, per night, based on double occupancy including VAT and city tax with a minimum five-nights. About Cannes: Palais St�phanie�s recent 38 million Euro renovation transformed this classic hotel into a vibrant and stylish hotspot reflecting its glamorous film heritage as it sits on the original site of the Palais des Congr�s, where the first Cannes Film Festivals were held. The hotel now features 261 spacious rooms and suites with upgraded flat screen TVs and high-speed Internet access; A heated rooftop swimming pool, Jacuzzis and Panorama bar; a full casino offering 150 slot machines and 19 gaming tables. Additional amenities and services include an 820-seat auditorium and flexible meeting space a shopping gallery, concierge, luggage room, and car rental. The hotel is conveniently within walking distance of the old city, Palais des Festivals and the old port and approximately 30 minutes by car from the Nice International Airport. Guests are also less than a mile from the Cannes TGV train station for convenient travel within Cannes and other destinations. For more information about Palais St�phanie and reservations please visit, www.PalaisStephanie.com or call +33 (0)4 92 99 70 00. Winter is a good time for a Santa Fe-cation because winter is value season in Santa Fe. All of the city's historic charm, attractions, and timeless appeal remain, even as lodging is at its lowest cost of the year. Whether skiing in the Southern Rockies just outside of town, exploring the city's diverse shopping and art districts, or simply taking some time out, Santa Fe's warm hospitality and bright winter sun are in place to welcome travelers. The past year in Santa Fe saw a number of highpoints; the New Mexico History Museum opened its doors, the city's 400th Anniversary began 16 months of commemoration, and American Eagle introduced service to the Santa Fe Municipal Airport with 3 daily flights�2 from Dallas and 1 from Los Angeles. With the onset of winter, the city's relaxed pace slows even more as we welcome the holidays and move into a new year. If it's a couple's escape you're thinking about, setting the mood for a romantic get away comes naturally to this old town. The city is filled with pampering accommodations, nurturing spas, and perfect tables for two. Santa Fe's intimate scale embraces every couple and walking is the best way to get around town or soak up the snow-covered mountain vistas. On a day when storms roll down from the Rockies, it can't get any better than curling up next to a kiva fireplace. Find some time for yourself this winter and let Santa Fe help you get in touch with the inner, relaxed, you. Look for lodging specials and everything that's going on in town at www.santafe.org. Winter Events: For the coming months Santa Fe's calendar is full of music, food, art, and seasonal cheer for everyone in search of a winter escape. Here is some of what is planned. December 24: The Plaza in Santa Fe is lit with 1,000 farolitos and traditional Christmas lights, refreshments are served, and a procession to the Cross of the Martyrs is held, all beginning at 5:00. For an updated calendar of Santa Fe Holiday events look to our listings at www.santafe.org/Visiting_Santa_Fe/Winter_Holiday_Events/. For ongoing winter savings and deals check in at www.santafe.org/Visiting_Santa_Fe/Winter_Holiday_Discounts/ and stay current with ways to save on lodging, ski packages, spa treatments, and more. January 30: Santa Fe Souper Bowl XVI � a fundraiser for The Food Depot featuring the best soups from the city's finest restaurants. At the Santa Fe Community Convention Center. www.thefooddepot.org. Ski Santa Fe is open for the season (12/12). With 67 runs and terrain for the first time skier or snowboarder as well as the most seasoned expert, Ski Santa Fe is an ideal winter escape in the Southern Rockies. Located, 16 miles from the heart of the city, and over 3,000 feet higher, the area covers 660 acres. The Chipmunk Corner children's ski center provides instruction for kids from ages 3 to 11 and daycare for kids from 3 months to 3 years. Check www.skisantafe.com for conditions. For more about Santa Fe during the winter or any season and to receive a free 2010 Santa Fe Visitors Guide contact the Santa Fe Convention and Visitors Bureau; scenter@santafe.org , 800-777-2489. Since the 9th century, the Cathedral in Santiago de Compostela, Galicia�s capital has been the destination for pilgrims following The Way of Saint James or El Camino de Santiago. They traveled on foot, horseback and more recently, on bicycles, lodging in albergues de peregrinos (accommodations offered free of charge to pilgrims) until they reached the stately Cathedral of St. James, said to hold the remains of the apostle. Legend has it that anyone who traveled to Santiago during a jubilee year were absolved of their sins. Declared a World Heritage site by UNESCO, Santiago retains its medieval air with beautiful golden granite mansions, impressive public buildings and many beautiful churches. Stone streets are porticoed to protect against passing showers. Considered one of the world�s great squares, the Praza do Obradoiro is dominated by the 11th century Cathedral and surrounded by many of Santiago�s historic buildings such as the Antiguo Hospital Real, the Palacio de Rajoy, the College of San Jer�nimo and the Gelm�rez Palace. � Pope Benedict XVI has been invited to Galicia; religious events focusing on the spiritual experience of the Camino will be staged; the celebration`s spirit of solidarity will be reflected in �For a World Free of Malaria� featuring sports exhibitions by star athletes such as tennis champion Rafael Nadal and soccer goalie Iker Casillas. � First International Travel Literature Conference; Auria Historical Novel Week; symposia with international leaders and great thinkers analyzing politics and society; congresses, seminars and workshops. �Conferences at the Metropolitan Museum of Art, New York. � Photography exhibitions created for Xacobeo 2010: Candida H�ffer: Libraries and Archives of the Camino de Santiago; Cristina Garc�a Rodero�s Galicia and the Sea, and Pierre Gonnord�s Dialogue of Landscapes and Souls. � Sports. Champion long-distance swimmer David Meca will cross the Camino as he swims the R�a de Arousa, and a circuit of women�s races will benefit breast cancer charities. � Gastronomy. Galicia�s cuisine is renowned. The region hosts some 300 food festivals annually showcasing its bounty from the sea such as oysters, octopus, sea urchins, eel, tuna, shellfish, and festivals featuring trout, goat, chestnuts, mushrooms, pancakes, empanadas, faba beans, androlla sausage, cheese and Galicia�s prestigious wines. � Children. Various events, audiovisual exhibitions and TV programs will be geared to children. � Music. Xacobeo Classics. The Xacobeo Festival will feature performances by Inma Shara, pianist Lang Lang, mezzo soprano Cecilia Bartoli, violinist Anne-Sophie Mutter, conductors Zubin Mehta and Vasily Petrenko and composer Alberto Zedda. The Via Stallae Festival will feature 100 concerts alone. Xacobeo Pop will present Sonar Festival, an international electronic music event. The MTV Festival will showcase Spanish and international music stars. The 40 Principales Festival will travel through the region and Mark Knopfler will present his �Get Lucky� album. In Xacobeo Importa, the U.S. will be represented by the folk band Vetiver and the Seattle grunge group Mudhoney. And in Xacobeo Roots � Galician music will take center stage with home-grown talent like: Berrog�eto, Luar Na Lubre, Susana Seivane, Cristina Pato, Bonovo, Fuxan Os Ventos and Leil�a. A particularly festive time to visit is during the Fiestas for the Apostle, July 19-25 that culminates in a display of fireworks, Fuegos del Ap�stol in front of the Cathedral in the Plaza del Obradoiro on July 24. "This winter we want to encourage visitors and residents to take advantage of unprecedented savings by patronizing luxury hotels participating in NYC & Company�s Signature Collection," said George Fertitta, CEO of NYC & Company. "Through the Third Night promotion, consumers can experience the vibrancy of our City without breaking the bank." The 15 hotels participating in the Third Night program are: The Carlyle, A Rosewood Hotel; H�tel Plaza Ath�n�e New York; Loews Regency Hotel; The London NYC; Mandarin Oriental, New York; The New York Palace; The Peninsula New York; The Pierre New York; The Plaza Hotel; The Ritz-Carlton New York, Central Park; The St. Regis New York; The Sherry Netherland; The Surrey; Trump International Hotel & Tower; and The Waldorf Towers. NYC & Company also today announced that luxury retailer Saks Fifth Avenue has reconfirmed its participation in the Third Night program this winter. Saks Fifth Avenue, whose iconic New York City flagship has long been the premier fashion destination for both visitors and residents of Manhattan, will offer a VIP shopping package to Third Night guests. The package includes an exclusive personal-shopping experience in the Fifth Avenue Club, special savings, and complimentary coffee and dessert at Saks Fifth Avenue�s Cafe SFA, which overlooks Rockefeller Center and the Channel Gardens. "Saks Fifth Avenue is pleased to participate again this winter in the Signature Collection Third Night promotion," said Kimberly Grabel, senior vice president of marketing at Saks Fifth Avenue. "We believe our VIP shopping experience is the perfect complement to a Signature Collection three-night stay and look forward to welcoming these visitors to our flagship store." The Signature Collection program was initiated in 2001 through the efforts of NYC & Company. The Third Night promotion is open to visitors and residents of New York City. NYC & Company's Signature Collection comprises 18 luxury hotels: The Carlyle, A Rosewood Hotel; Hotel Plaza Ath�n�e; Jumeirah Essex House; Loews Regency Hotel; The London NYC; Mandarin Oriental, New York; The New York Palace; The Peninsula New York Hotel; The Pierre New York; The Plaza Hotel; The Ritz-Carlton New York, Battery Park; The Ritz-Carlton New York, Central Park; The Sherry Netherland; The St. Regis New York; The Surrey; Trump International Hotel & Tower; Trump SoHo New York and The Waldorf Towers. NYC & Company, the official marketing, tourism and partnership organization for the City of New York, today announced that 15 hotels in the Signature Collection, a group of New York City's luxury hotels, will participate in the Signature Collection Third Night� promotion this winter. The program gives visitors a complimentary third night at participating hotels after booking and paying for two consecutive nights between January 4 and February 28, 2010. Detailed booking information for the promotion is available on NYC & Company's official tourism website at nycgo.com/thirdnight. "Live the Deal", an innovative, global campaign to help travel companies and destinations respond to Climate Change, reduce their carbon footprint and move to the Green Economy, was launched this week during the Copenhagen Climate Summit. Announcing the new initiative, long time tourism green campaigner Geoffrey Lipman UNWTO Assistant Secretary-General said: �What Copenhagen represents is a new commitment by the world community towards sustainable low carbon growth patterns. The targets and mitigation actions that countries develop and negotiate through this process will be a new base for travel industry action. What we are providing is a very simple way to get behind the evolving government initiatives, to keep pace with changing patterns and to demonstrate that our sector is acting, not simply talking.� He added �We should not be ashamed to promote the growth of smart travel � clean green, ethical and quality - it�s the lifeblood of trade, commerce and human connection�. �Live the Deal� follows the pattern established in the UN led Copenhagen Seal the Deal campaign by its single minded focus, its simplicity and its broad based engagement goals. It will seek to encourage the sector directly and through representative organizations. It has been developed with the support of UNWTO, whose Secretary-General Taleb Rifai calls it �The kind of link between global policymaking and responsible tourism action that we are looking to inspire and encourage. Our sector fuels the economy, creates jobs and is one of the biggest development opportunities for the world's poorest countries � and it can be a leader in the transformation to a green economy�. New Delhi�s newest five-star hotel is rising on three acres of prime land in India�s capital. Just in time for the 2010 Commonwealth Games, The Leela Palaces, Hotels & Resorts will welcome its newest luxury property in a convenient location at the cover of Africa Avenue and Vinay Marg in Chanakyapuri, the Central Business District and the city�s diplomatic enclave. The Leela Palace Kempinski New Delhi will have 260 rooms and suites, five restaurants, two bars, a spa by ESPA, a fitness center and a swimming pool on its roof terrace. An outpost of MEGU, the Japanese restaurant, will open at The Leela along with an intimate Indian restaurant, another featuring Italian cuisine with an open kitchen and an all-day dining restaurant also with a �live� kitchen. Inspired by the style of Edwin Lutyens, the architect who laid out New Delhi almost 100 years ago, The Leela Palace�s design will combine neo-Classical architecture with elements from north Indian palaces. Deluxe rooms will measure over 500 square feet with suites starting at 785 square feet. Three Royal Suites (up to 1,500 square feet) will have private pools and the Presidential Suite will be an impressive 4,000 square feet. To accommodate meetings and incentives, The Leela will have a number of meeting rooms including a 5,800-square-foot ballroom. The five-star Leela Palace Kempinski New Delhi will open before the Commonwealth Games which begin on October 3, 2010. The Leela Palaces, Hotels & Resorts has established a global leadership position in the luxury hospitality industry offering hotels in premier locations, elegant facilities and personalized service to the world�s most discerning travelers. It�s bouquet of award-winning hotels includes: The Leelas in Mumbai, Bangalore, Goa, Kovalam (Kerala), Gurgaon and Udaipur. The group is introducing hotels in New Delhi (2010) and Chennai (2011,) with future plans to develop hotels in Agra, Hyderabad and Pune. The group has marketing alliances with Germany based Kempinski (Hoteliers since 1897); US based Preferred Hotel Group and are members of Global Hotel Alliance based in Geneva, Switzerland. Tahiti Tourisme North America announces upcoming seven night specials to the famed islands of Moorea and Bora Bora. Beginning January 5, 2010, travelers can book their very own couples retreat to the world�s most romantic islands. Amazing savings will include a thirty percent discount on international air. Packages must be purchased between January 5 and January 19, 2010. Packages are valid for travel from January 5 � March 31, 2010 and must be purchased between January 5 and January 19, 2010. For more information after January 5, 2010, visit www.tahiti-tourisme.com or call (877) GO -TAHITI. Participating tour operator partners include Island Escapes by Goway; Pacific Holidays, Pleasant Holidays, Sunspots International, Tahiti Legends and Qantas Vacations. Restrictions: Prices are �from�, per person, based on double occupancy. Single supplements apply. Strictly subject to availability at time of booking. U.S. foreign taxes of approximately $94, includes September 11 security fee additional. Prices, itinerary and conditions are subject to change without notice. City tax of approx. $1.80 per person, per night is not included. The islands of Tahiti are closer than you think, Tahiti is eight hours from Los Angeles with daily, nonstop flights. Tahiti is halfway between California and Australia, on the same side of the International Date Line as North America and in the same time zone as Hawaii. (New York, December 30, 2009) Since Northwest Flight 253 was threatened on December 25th by a passenger carrying explosives, the United States Transportation Security Administration (TSA) and many international governments have imposed confidential air travel security measures that will impact travelers around the world. Travel publisher FamilyTravelForum.com alerts all holiday travelers, especially families with young children who may be carrying gift items, to be prepared for the enhanced and possibly invasive security procedures. As Department of Homeland Security Secretary Napolitano has cautioned, "These measures are designed to be unpredictable, so passengers should not expect to see the same thing everywhere." 10 facts travelers should know. Enhanced security precautions are in place at all international airports with flights to the U.S.
All carry-on bags are being subjected to extra security screenings, causing delays at security gates. The Canadian government has banned all carry-on bags for passengers traveling to the U.S. because new screening requirements are causing excessive delays. Only exceptions are purses, cameras, coats, laptops, musical instruments, medical devices and items for baby care. TSA urges all travelers to check as much carry-on baggage as possible but says that items such as car seats will be accepted on board flights. Alaska Airlines and Horizon Air are both waiving some baggage fees for the mandatory checked baggage on flights to the U.S. from Mexico and Canada. According to the TSA, all passengers regardless of age (including minors and unaccompanied minors) will be subject to additional screening if selected at random or if circumstances warrant. Secondary passenger screenings are very likely to include full body pat-downs and manual inspection of all hand carried items. In flight, at the discretion of the pilot and the individual airline, passengers may be required to stow all their personal belongings for any portion of the flight. In flight, passengers may be required to remain in their seats with their hands fully exposed to view, for any portion of the flight but most likely, for the final hour of the flight. Parents should discuss these enhanced security procedures with their children prior to travel, and that travelers use the CBP website (visit www.cbp.gov/xp/cgov/travel/wait_times/ ) to check on the estimated waiting times at all U.S. air, land and sea borders before making their travel plans. According to TSA spokesperson Ann Davis, these security precautions and other undisclosed ones will remain in effect indefinitely.